How to resize Windows 2003 partition in VMware workstation or Server? VMware are so popular with the public since it supports any operations like the really machine. However VMware often encounter the partition size or disk size problem since it is extremely large and it will become larger when installing with operating systems and store files. Can you resize VMware Windows 2003 partitions after you have set the partition? The good news is with Partition Magic Server software you can easily resize Windows 2003 Server partition for physical disk partition or VMware virtual disk partitions without data loss. If there is free space in other data partition on the same virtual disk, you just need to shrink the data partition to get some free (Unallocated) space at the end of the system partition, and then you can easily extend the system C drive. If the entire virtual disk is too small and no free space in other data partition, or there is only C drive in the virtual disk, you need to extend the VMware virtual disk before resizing partition. Step 1, Install Partition Magic Server to VMware and launch it you'll see all disks and partitions that connected to your Server and free space, used space and other properties of each partition. Why this is the easiest and fastest way to resize Windows 2003 partition in VMware? You just need to install the application, drag and move on the disk map to resize partitions. After several minutes, you'll have a "new" Server. No other operations are required. 3. Will create a new (many GB) copy of your VMware virtual disk and reduce the physical partition free space. 4. You need to remove copied virtual disk or change the disk slot, too difficult to many users and may lead to data loss or boot failure. In conclusion, to a Server especially production Server, the data security and time is most important. 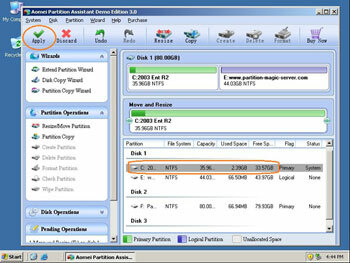 With Partition Magic Server, you can resize Windows 2003 partition for VMware fast, easily and safely. See full features or download free trial to check how easy it is to resize Windows 2003 partition in VMware. How to extend C drive of Windows 2003 Server? How to extend SBS 2003 Server partition? How to resize Windows 2003 Server partition?